My mother surprised me with a new cake stand addition. We are guessing this one is from the 1950s or 60s. It has a hobnail type of border, etched, and has a light blue hue to it. It isn't very tall, either, which I like. 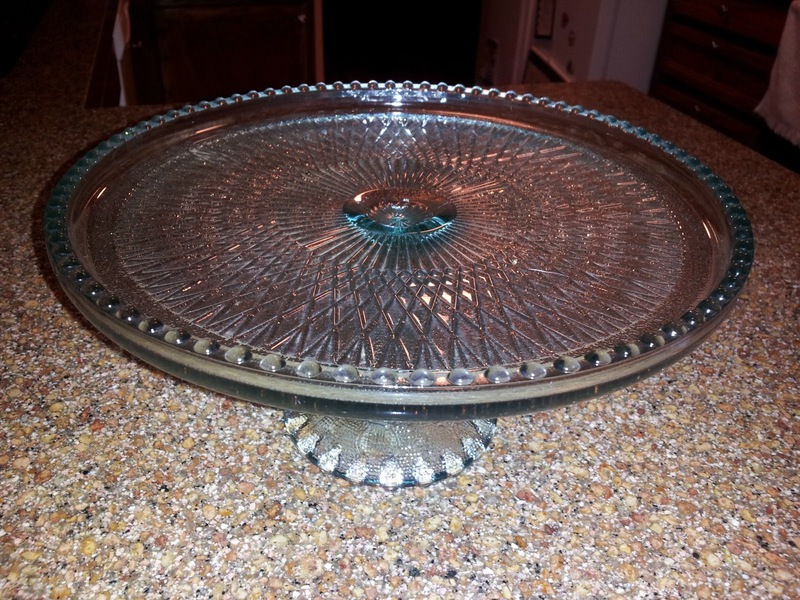 Most cake stands I have are the taller variety. I enjoy the short stands because they are so much easier to store on top of my kitchen cabinets. Nah, it doesn't matter what cake is on this stand. No matter what flavor, it's going to be hoisted up on its pedestal in a regal manner. Let them eat cake! Hello, I just purchased a cake stand exactly like this at a flea market type store yesterday for $12, and I was wondering if you knew anything else about it. I couldn't find a brand name or anything etched on it anywhere. Thanks!